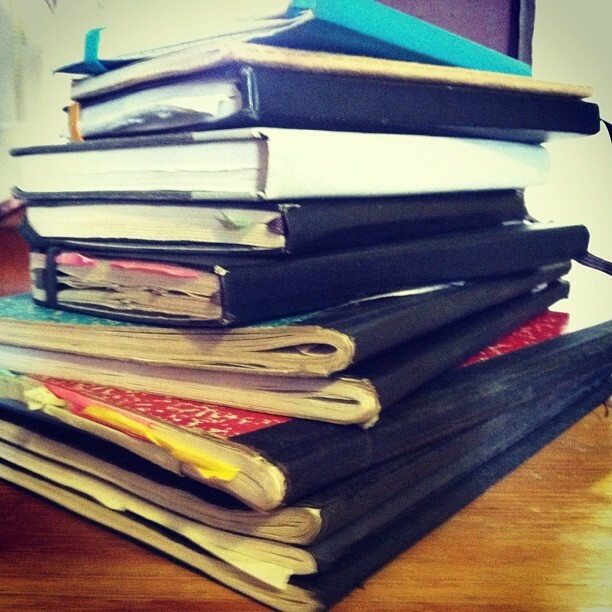 Looking at some of my teaching journals stacked up, I can’t help but think about how the chronicling of time, events, and thoughts has shifted. I’m also thinking about how the value/power/purpose of these thoughts changes if they remain hidden or become public. I no longer keep a journal in the traditional sense; instead, electronic conversations help me keep track. But there was something methodical about keeping a personal, private, handwritten journal, and as I mentioned in this earlier post, I intend to periodically revisit entries about teaching, since so much of my research is inspired by what’s contained in these well-worn tomes. This entry from a few years back, when I was a new-ish graduate student and adjuncting at the Hunter College School of Education, led me to consider using James C. Scott’s theory of the hidden transcript as part of the theoretical framework for my dissertation. Something shifted for me that afternoon while sitting on the floor of a Barnes & Noble in Brooklyn and gazing up at the stacks of books. There was (and still is) something wrong with this picture. I found myself at a Barnes & Noble in downtown Brooklyn today, and wandered toward the education section, per usual. I sat down amid the stacks, and looked up at the books. These titles stared back at me: Discipline Survival Kit, Teach Like Your Hair’s on Fire, Classroom Teacher’s Survival Guide, Whatever It Takes, Not In My Classroom, How to Handle Difficult Parents, Failure is Not an Option, and Fires in the Bathroom. My jaw literally dropped – how had I missed this before? Almost every book title suggests how to survive in the classroom. They point the finger at unruly children, hard-to-handle parents, unreasonable administrators, unknowing policy makers, or teachers themselves (these were my particular favorites, suggesting hot baths and essential oils, eating out a few times a week, and seeking grants to defray the unbelievably high cost of teaching materials). So maybe it’s not that teachers’ experiences need to be inserted into the public transcript – it’s not a secret that teaching in urban schools can be a challenge, and movies, books, and articles paint a vivid picture – rather, we need a new paradigm for looking at why.